thoughts about life from beyond the grave: AN ANNOUNCEMENT ! The day before yesterday my sixth great grandchild was born! 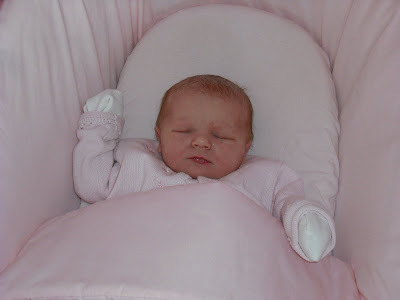 A beautiful little girl.... mother and baby doing fine, she weighed in at 6lb 12 oz and her name is Natasha! My family now consists - 4 children ( all girls), 11 grandchildren ( 5 girls and 6 boys) and 6 great grandchildren ( 5 girls and 1 boy) -- isn't that wonderful! To me that is what life is all about---families . Congratulations! What a beautiful baby. I hope mom and baby are doing well and getting lots of rest. Oh thankyou Cori. All are well, apparently the baby is sleeping at night and giving my grandaughter a good rest! Congratulations, Delphine! What a gorgeous baby!!! I love the name they chose for her. You must be so excited. Being a grandparent is wonderful, I must agree. I have 5 and that will probably be all for me, but they fill our lives with so much joy. Blessings to the wee one! Oh wow, I know I posted here but I don't see my comment. Maybe it didnt go through and I didn't notice. Beautiful beautiful baby. Will enjoy seeing photos as the months go by.